Nishat garden housing scheme Sambrial is on going residential project by FNG developers and marketed by Fast marketing consultants. Project offers various sizes of 5 marla, 10marla and 1 kanal residential plots and also commercial plots on installments and cash payment. Booking is now open for this project on first come first served basis. Here are the details of this project mentioned below. Nishat garden housing scheme in Smabrial is located at ideal location of main Kachery road. 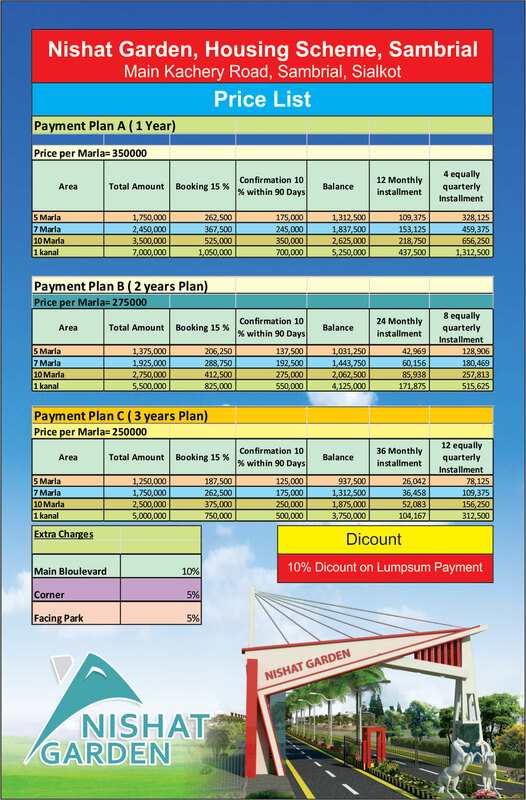 Booking starts from 15% down payment and rest of the amount will be paid in 1 year, 2 year and 3 year installments. 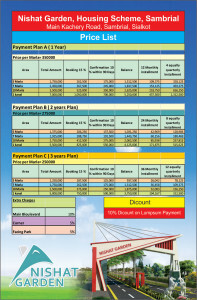 10% discount on full cash payment and also 10% extra charge on main boulevard plots. All payments made in favour of FNG developers.